Gray's Atlas Map of North Carolina. 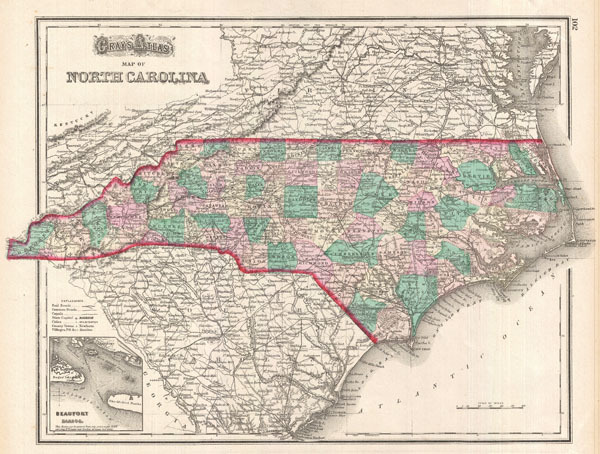 A very attractive 1874 map of North Carolina by O. Gray. This map covers the entire state in considerable detail with vivid hand coloring at the county level. Notes roads, railways, towns and cities, and some topographical detail. An inset map in the lower left quadrant detail Beaufort Harbor. Published as plate 102 in the 1874 edition of Gray's Atlas. Gray, O., Gray's Atlas Of The United States, With General Maps Of The World. Accompanied By Descriptions Geographical, Historical, Scientific and Statistical. (Philadelphia) 1874. Very good. Map of Virginia on verso.